We don’t always have time to read long, insightful articles. Sometimes all we need is a few words that precisely express what we know, believe and think. Quotes have that power. They can sum up an idea perfectly, while numbers only tell part of the story. 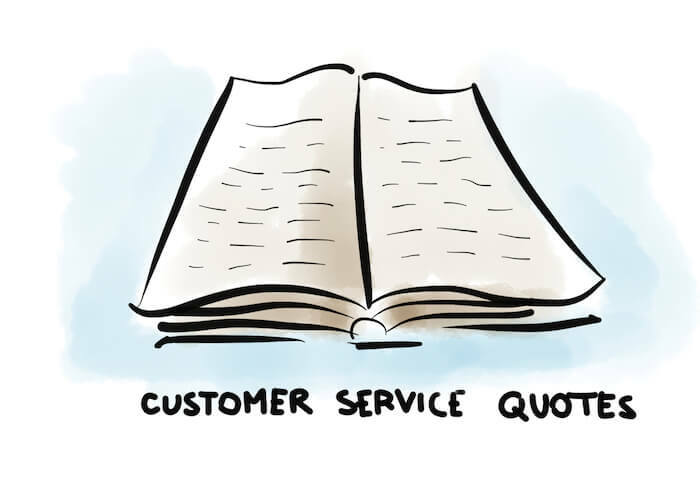 Here are some great customer service quotes and quick lessons you can learn from them. Having a strong customer service culture can only benefit your business. Satisfied customers convert into more buying, loyal customers. Once they become your brand advocates, they do marketing for free. They tell stories about your company and recommend it whenever they have a chance. They create excellent word of mouth, which is one of the most powerful ways to influence business results. Competition is good, because it motivates you. But it doesn’t reflect your abilities and potential. At the end of the day, you are your biggest competitor. Adopt a customer–centric mindset. What more can you do to provide better service, memorable experiences and create emotional connection with customers? Focus your mind on that, get closer to customers, and leave the competition behind. You have an online business. Yet it doesn’t mean you can’t get out of your office once in a while and meet with your customers face to face. Or at least, schedule a Skype conversation. Our CEO goes across the world twice a year to meet with our customers in their companies. By talking with customers one–on–one or watching the way they use our product, he can gain their perspective. As a result, he creates successful relationships with customers and he knows what we can do to make them happy. When it comes to business success, it is all about people. But, in the sales–oriented business world, it’s easy to forget that behind every sale is a person. If you tell your team to make more sales, they will probably make more sales. But are they making loyal customers? Customer–focused mindset is a way better strategy that pays off for longer. It’s not easy to handle criticism from customers. It’s easier to claim that they don’t understand the product or they’re simply just not right. But if you want to constantly get better, it’s worth to stop for a minute and listen to what customers have to say about you, especially when they’re not satisfied. Truth is, most customers will never bother to complain. They just won’t come back. The ones who complain don’t want to leave you. They want you to get it sorted, because they still care. And that makes them a valuable source. This quote puts you in the right mindset to work in customer service. You should always keep it in mind. It would be best if you print it and hang it by your desk. Every day customers depend on you when they buy or when they need your help. In the heat of work, it’s easy to forget, that in reality, you are more dependent on them. Without customers you have no cash flow, no salaries, no jobs, no business at all. That’s why it’s important that customers always feel welcomed and encouraged to contact you whenever they want to. If they don’t feel welcomed, they will find somebody else who will serve them with pleasure. Having a strong customer–service culture can only benefit your business. Happy and satisfied customers are the only way to stay ahead of the competition. So make them your priority. I hope these great customer service quotes will help you do it.